Acknowledging the accomplishments of our brightest stars! We are very proud of four Alumni of our Paramedic Program who were recently presented with financial awards from the Hunter's Memorial Scholarship Fund in memory of William Lawton & Carol Gillooly. We couldn't think of folks more deserving than the recipients: Mark Bascetta, Nina Fish, Lillian Gopoian, and Kourtney Markie. Proud of our JEMS Team – 3rd place in a national competition is something to be proud of. 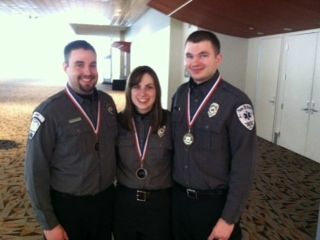 Strong Work Paramedics Adelson, May and Bertlesen. Our Paramedic Recruits would like to thank Cardiovascular Perfusionist (Lahey Clinic) and former NBEMS Paramedic Sean O’Brien for two great days of lecture and lab. Your energy and shared knowledge have prepared our students well. We appreciate you!